What it takes to be successful in business? This is probably the most common question arise in businessman’s mind today. 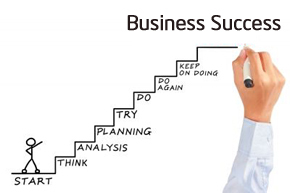 To get answer of this question we have done some research and we are herewith 30 steps for success of small business. If you are planning to start business or struggling in business to get success you must go through this article. First step in starting any business is to carry out market research to know target group. This is something like making yourself aware before starting business. Second step is to size the market and to do competitor analysis. It is very important to make yourself ready by knowing about market and competitors. By this step you will able to decide your product or service can withstand market or not. 3. How much investment is required? Third step is to find answer about how much investment is required for said business. In this step you many need help of CA or expert. 4. What is expected ROI? Forth step is to get idea about ROI. It is good to know that how much return this business can generate in future. Fifth step is to get capital. If your capital requirement is high you need to contact bank or venture capitalist for capital. Next is to hire correct people at correct place. Before recruiting people you should define roles and responsibility of person. This is to make sure that people work efficiently once they join your business. Now you need to arrange for infrastructure required for running your business. Infrastructure includes office space, transport vehicle, computer items etc. Next is to decide legal structure of your business (propriety firm, private limited etc). Once you decide legal structure you need to register your business. Once your business is register you need to get PAN number and service tax number. Service tax number is required only if you are planning to offer services. If you are not able to finance your business on own you need to raise capital from market. Make sure that you are using this capital correctly as per business need. You can get in touch with venture capitalist for generating capital. Make sure you need to prepare full proof business plan and documents before approaching Venture capitalist. You can explore possibility of getting government assistance under SME and MSME scheme. Next is you need to maintain statutory compliance in terms of PPF, ESIC, TDS and Insurance. Once your business is established you need to continuously observe financial condition of your business. If you are holding small business it is possible that personal expense will get mixed with your business expense. You need to create mechanism for separating personal and business expense. Next is to estimate and price your product or service correctly. This is important to withstand in competitive environment. Once you establish your business it is important to review income (revenue) and expense at regular interval. This is to control unnecessary expense. Next is to understand asset and liability of business. If liability is more you can take corrective action. Managing working capital is another important point for the success of business. At any point of time you must have working capital to manage business effectively. You should also develop skill to understand financial statements including profit and loss statement, balance sheet, inventory etc. You should pay sale tax, income tax, service tax and professional tax on time. This is to avoid loss of late fees and penalty. You should always remain compliance for audit. Occasionally you should go for external audit. To grow your business you must know valuation of your business. You can take help of external consultant to calculate current value. You should adopt practice of ensuring accurate book keeping. This will you to grow your business. You have to make accurate budget with expected cash flow & expense detail. This will help you keep your business healthy. While making budget you should consider marketing and hiring expense. If you have taken loan you should make plan for repayment of debt. Repayment of debt will reduce your interest burden & also improve your credit. You should focus on people management. Appointing correct people at correct place is key t0 business success. You should develop strategy to fight against stiff competition. This may require additional budget for advertisement or product feature development. To grow your business you should continuously focus on product innovation. Your product should be different compare to competition. Distinguishing your product with competition will give you additional advantage. Another way to get business success is by capturing new market. Great ideas…would love to more in terms of health sector. very usefull idea, i am searching evergreen and growing bussines. Very nice artical. Really I was unaware of all these things. Very knowledgeble. Keep writing these kind or artical.